<p /> <small>Photo by <a href="http://www.shutterstock.com/pic-61131100/stock-photo-silk-ties-isolated-on-white.html">Shutterstock</a></small> <p /> Your dad's the ultimate do-it-yourselfer, which means the last thing he wants for <a href="http://www.ecouterre.com/14-eco-friendly-fathers-day-gifts-to-show-pops-hes-tops/">Father's Day</a> is some cookie-cutter tchotchke from a big-box store. Give your old man a thrill with a gift you made with your own two hands. Need a little coaching? 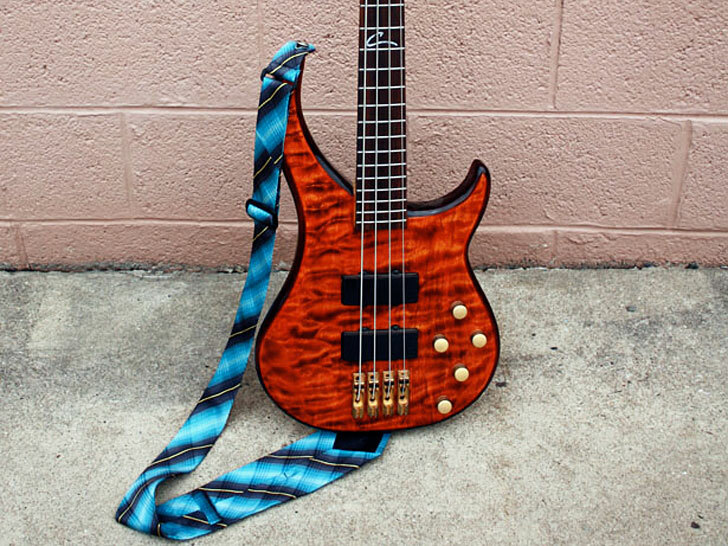 Here are five ways to use recycled neckties to dress up the occasion. <h3>GUITAR STRAP</h3> <h3>MATERIALS AND SUPPLIES</h3> <ul> <li>Necktie</li> <li>Ruler</li> <li>Fabric scissors</li> <li>1½-inch wide slide and tri-glide</li> <li>Needle and thread or sewing machine</li> </ul> <p /> <h3>DIRECTIONS</h3> 1. Cut off the tip of your tie 4.5 inches from the skinny end. <p /> 2. Take this piece and slip the slide through the cut end. With the wrong side of the tie facing up, fold the cut end down to keep the slide in place. Sew the fold in place with a running stitch. <p /> 3. Take the long necktie piece and slide the cut end through the tri-glide. Then slide the end through the slide and back up and around the center of the tri-glide. Fold the cut end down about 1 inch. Stitch in place with a running stitch. <p /> 4. Create buttonholes on each end of the necktie, starting about ¾ inch from the end. Make the buttonhole about ¾ inch in length. (<strong>Tip:</strong> It’s best to keep the buttonhole on the tighter side because you want to ensure a secure fit on the guitar.) Attach each end to your guitar. 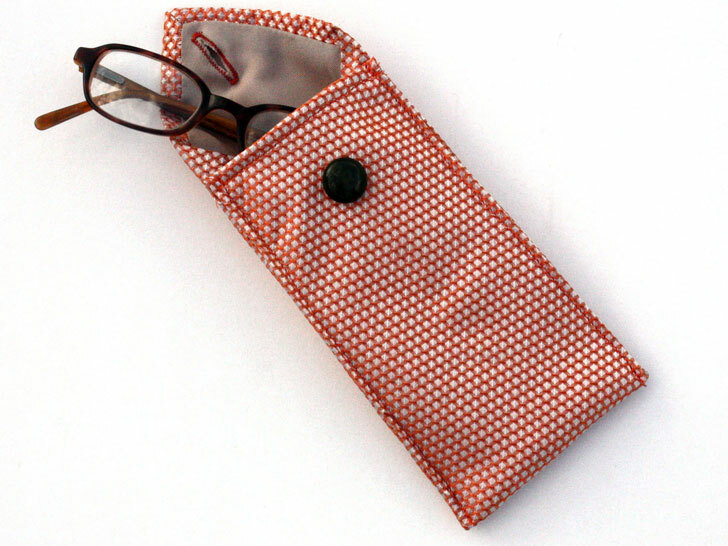 <h3>EYEGLASSES HOLDER</h3> <h3>MATERIALS AND SUPPLIES</h3> <ul> <li>Necktie</li> <li>Ruler</li> <li>Fabric scissors</li> <li>Button</li> <li>Needle and thread or sewing machine</li> </ul> <h3>DIRECTIONS</h3> <p /> 1. Cut your necktie 16 inches from the wide end. <p /> 2. Add a buttonhole to the tip of the tie starting ¾ inch from the end. Make your buttonhole large enough to fit your button. <p /> 3. Place your button about 1¾ inch from the cut edge. Sew in place. <p /> 4. With the wrong side of the tie facing up, make a fold ½ inch down from the cut end. Stitch in place with a running stitch. <p /> 5. 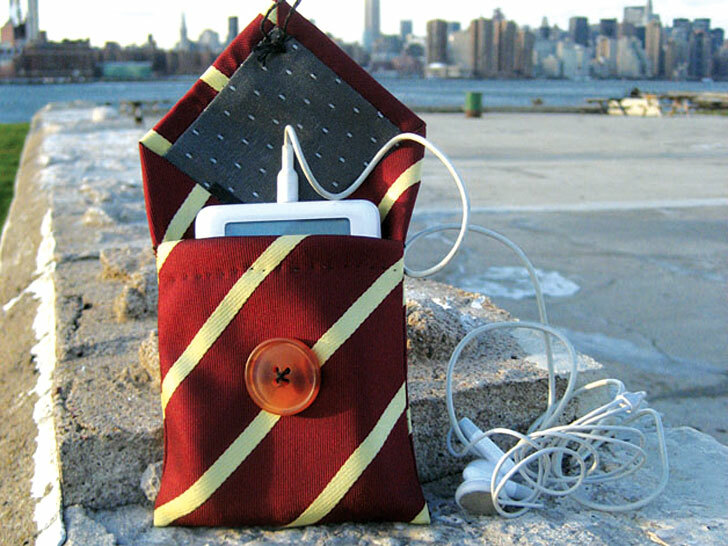 Fold up the bottom 6 inches of the tie and stitch up the left and right edges to form a pocket. The button should be on the front and center of this pocket. 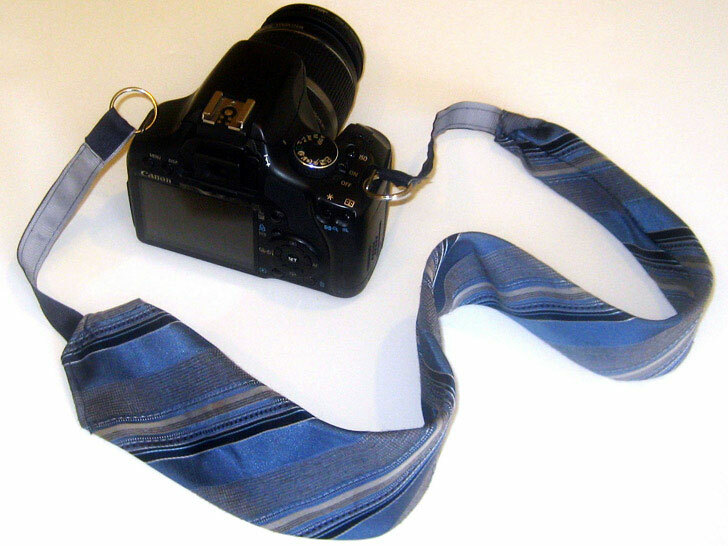 <h3>CAMERA STRAP</h3> <h3>MATERIALS AND SUPPLIES</h3> <ul> <li>Necktie</li> <li>Needle and thread or sewing machine</li> <li>Pins</li> <li>1-inch wide ribbon or webbing</li> <li>Two keychain rings or large split rings</li> <li>Measuring tape</li> </ul> <h3>DIRECTIONS</h3> 1. Start by measuring and cutting 27 inches from the tip of the necktie. <p /> 2. Fold up ½ inch on both ends (one end will be cut and the other will be pointed). Then, pin and stitch in place. <p /> 3. Cut two pieces of ribbon or webbing to 7.5 inches. (<strong>Tip:</strong> If the ribbon or webbing is polyester you can burn the ends with a lighter to keep them from fraying.) 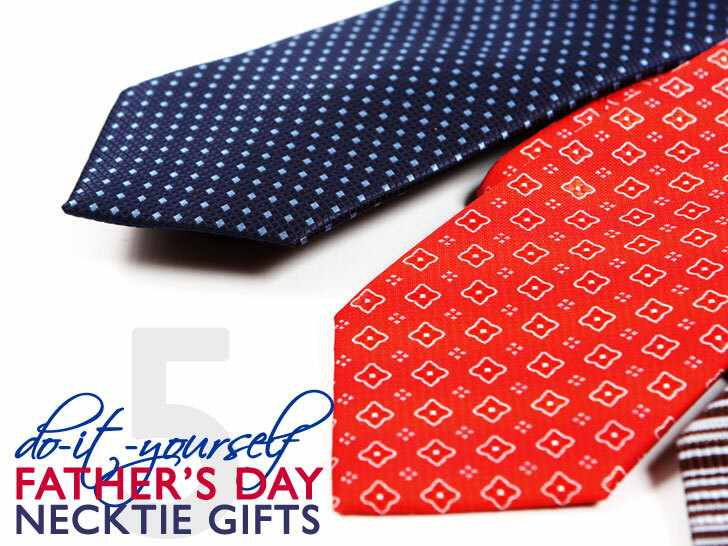 <p /> Fold the ribbon pieces in half lengthwise and overlay it by 1 inch on the ends of the necktie. Pin in place. Stitch a square with an “x” in the middle securing the overlapped pieces together. 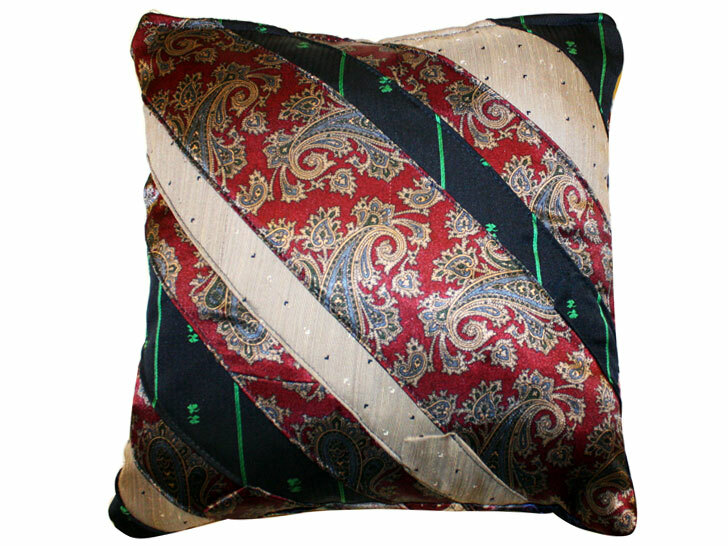 <h3>PILLOW</h3> <h3>MATERIALS AND SUPPLIES</h3> <ul> <li>Six neckties</li> <li>Ruler</li> <li>Scrap paper</li> <li>Fabric scissors</li> <li>Needle and thread or sewing machine</li> <li>Pillow stuffing or soft fabric scraps</li> </ul> <h3>DIRECTIONS</h3> 1. Determine the size you’d like your pillow. Add an inch to that measurement for seam allowance and cut out a square to this size. This will be your basic pillow pattern. We wanted a 12-inch pillow, so we cut out a 13-inch square. <p /> 2. Arrange your neckties as you’d like on top of your pattern overlapping the neckties by about ½ inch. Pin the necktie pieces together. Create two squares for the front and back of the pillow. <p /> 3. Sew the necktie pieces to each other for both squares. <p /> 4. To create your pillow place the right sides of the square panels together and pin around the outside edge. Sew along this edge leaving 6 inches open along one side. <p /> 5. Turn your piece inside out through this opening. Fill with stuffing or soft scraps of fabric. Once your pillow is filled, sew the opening closed.